Pray, O holy Martyr, for the Faithful, who are so persevering in celebrating thy memory. The day of Judgment will reveal to us all thy glorious merits: oh! intercede for us, that we may then be made thy companions at the right hand of the Great Judge, and be united with thee eternally in heaven. Grant, we beseech thee, O Almighty God, that we who solemnize the festival of blessed Valentine thy Martyr, may, by his intercession be delivered from all the evils that threaten us. Through our Lord Jesus Christ, thy Son, who liveth and reigneth with thee, in the unity of the Holy Ghost, God, world without end. Amen. The Church honours, on this fourteenth day of February, the memory of the holy Priest, Valentine, who suffered martyrdom towards the middle of the third century. The ravages of time have deprived us of the details of his life and sufferings; so that extremely little is known of our Saint. This is the reason of there being no Lessons of his Life in the Roman Liturgy. His name, however, has always been honoured throughout the whole Church, and it is our duty to revere him as one of our protectors. He is one of those many holy Martyrs, who meet us at this period of our Year, and encourage us to spare no sacrifice which can restore us to, or increase within us, the grace of God. Pray, then, holy Martyr, for the Faithful, who are so persevering in celebrating thy memory. The day of Judgment will reveal to us all thy glorious merits: oh! intercede for us, that we may then be made thy companions at the right hand of the Great Judge, and be united with thee eternally in heaven. Another account of St. Valentine. 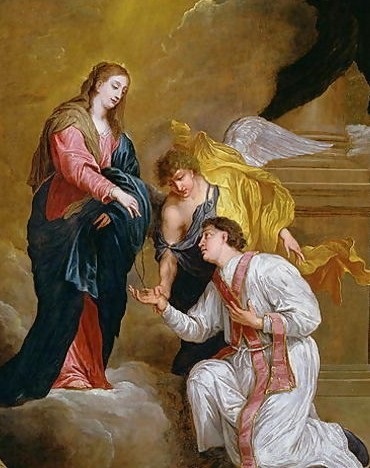 Valentine was a holy priest in Rome, who, with St. Marius and his family, assisted the martyrs in the persecution under Claudius II. He was apprehended, and sent by the emperor to the prefect of Rome; who, on finding all his promises to make him renounce his faith ineffectual, commanded him to be beaten with clubs, and afterwards to be beheaded, which was executed on the 14th of February, about the year 270. Pope Julius I is said to have built a church near Ponte Mole to his memory, which for a long time gave name to the gate, now called Porta del Popolo, formerly Porta Valentini. The greatest part of his relics are now in the church of S. Praxedes. His name is celebrated as that of an illustrious martyr, in the sacramentary of St. Gregory, the Roman missal of Thomasius, in the calendar of F. Fronto, and that of Allatius, in Bede, Usuard, Ado, Notker, and all other martyrologies on this day. To abolish the heathen's lewd superstitious custom of boys drawing the names of girls, in honor of their goddess Februata Juno, on the 15th of this month, several zealous pastors substituted the names of saints in billets given on this day.